My closest friends know that I have two guilty pleasures. I’m not sure what’s more comical – the fact I only have two, or what those two things are. The first one is Judge Judy. There, I said it. I mean really…who doesn’t love The Judy? She’s a spitfire, funny and can tear you a new one in front of millions a people and get paid millions for doing it. Did you know she is one of the highest paid television personalities, annually? Yeah. Totally serious here. Look it up. It will floor you. How much do I love The Judy? Let’s put it this way. I will come home from whatever I’m doing to watch her. And I get really cranky during the NCAA basketball finals because the games preempt the show. Really. Cranky. My other guilty pleasure is chicken wings. I could eat them everyday, in huge quantities. But they can’t be just any old chicken wing. They have to have the right meat to sauce to heat to crispiness ratio. This is where a lot of restaurants get it wrong. If you serve me a wing that is not cooked throughout, has little to no sauce, has too much sauce, is not crispy on the outside, you are pretty much dead to me. I mean it. Wet, overly juicy wings are gross. While I am still on the hunt for the best wings in Seattle, so far, and somewhat sadly, the only place where they seem to get it right is Whole Foods. Which is somewhat sad for a couple of reasons. On is that they’re seasonal. If it ain’t football season, they ain’t got ’em. You’ve been warned. And two, why can’t any restaurant in Seattle give me a perfect crispy chicken wing? Am I the minority? Am I the only one that likes them crispy on the outside? It just can’t be. So to get me through the non football season and when only crispy will do, I make these. 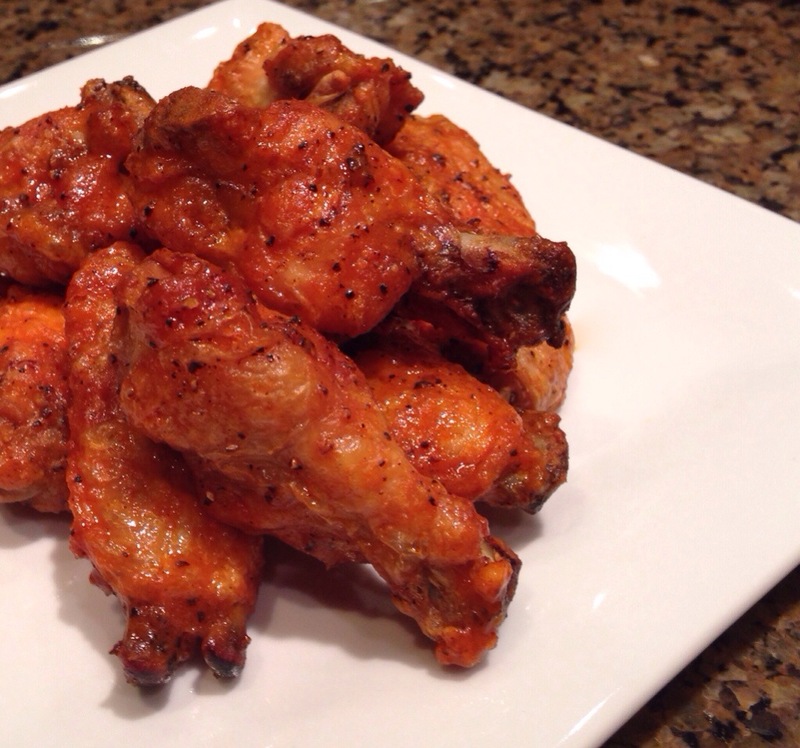 Baked chicken wings that are crispy and so freaking yummy and so easy to make. Preheat oven to 400 degrees. Line four baking sheets with foil and place a cookie cooling rack on each (or work in batches for however many sheet/racks you have or your oven will hold.) Rinse the chicken wing pieces with water and pat dry with paper towel. Put chicken in a large bowl and add the oil. Toss to coat. Add salt and pepper – your preferred amount – and toss. Place wings on top of the racks making sure to spread them out well so they can evenly bake. Bake in oven for 45 minutes. While the wings are baking, combine the butter, cayenne pepper and cracked black pepper into a mall saucepan. Heat over medium until the butter is completely melted. Lower the heat to a simmer and cook for 3 minutes. Add the Frank’s sauce and cook for 2 minutes still on a slow simmer. Add salt to taste. Remove from heat and cover until the wings are done baking. When wings are done, remove from the oven and put into a large bowl. Pour the sauce over them – however much or a little as you prefer – and toss until the wings are thoroughly coated. Serve with ranch or blue cheese dressing.